Hello and welcome to West Berkshire Foot Clinic. Having worked with other podiatrists to set up two successful clinics locally, I decided to set up my own practice in 2018. I have always wanted to be a Health Care Professional and I thrive on getting to know my patients and relieving their foot pain. I love the feeling when my patients say they feel like they are walking on air when they leave the clinic with a smile on their face! 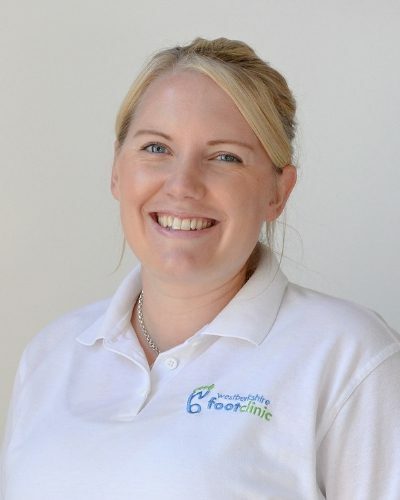 I trained at The University of Southampton and spent many years in the NHS working in the local diabetic footcare team, as well as 5 years in a private practice in Berkshire and Hampshire. I have successfully treated many patients over the years improving and curing them of their painful foot problems. I offer the latest research lead technologies available to ensure the best results for my patients. I was raised with my younger sister in a small village outside Henley-on-Thames where my parents still live. I met my lovely, supportive husband Ed when I was 16, before my career in Podiatry had even started! Ed and I live locally with our two gorgeous children Amelia and James. My family and friends are very important to me, so when I am not working you will probably find me exploring the lovely countryside, participating in games of pooh sticks with the children and enjoying family life. I spend a lot of time with our extended family and close friends and most weekends are spent getting together and watching the children play. I am an active part of Amelia’s school as co-chair of the PTFA and on the commitee for James’ pre-school. If I am not fundraising for the schools I am often found baking for the various cake sales or birthdays! I am extremely excited to offer a high quality podiatry and chiropody service to all those in the local area and I look forward to meeting you and addressing all of your footcare needs. Occasional evenings and weekends available on request.